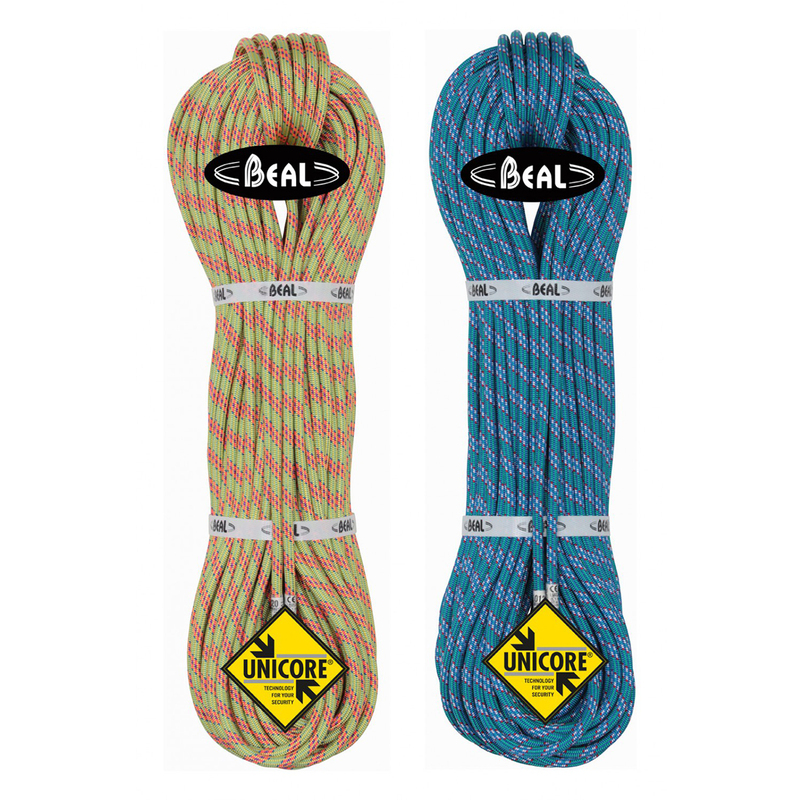 The Beal Ice Line 8.1 mm provides a very low impact force of 4.9 kN (whereas the standard for half ropes is 8 kN). This 37% reduction in force provides a very soft fall, which is of course always lovely but will be most useful when used on hard trad and ice routes when you really want your protection or ice screws to stay firmly in place. The Ice Line also features UNICORE technology to eliminate sheath slippage, and its Golden Dry treatment runs extremely smooth and is highly water-resistant. Both of these features which will greatly extend the safe usable lifespan of the rope. The Ice Line is highly durable and absorbent (in the right places). The UNICORE process permanently bonds the sheath and core of the rope together to eliminate sheath slippage, the name given to the amount of sheath that bunches up, usually at the ends of the rope, revealing the rope's inner core. A water-repellent treatment that's applied to both the rope's core and its sheath. This makes the rope highly resistant to water absorption and prevents the penetration of harmful dust dirt and dust particles into the rope's fibres. Golden Dry ropes are ideal for use in all weather conditions, including ice and snow, where they will absorb the minimum amount of moisture, and they will last through much harsher abuse that non-treated ropes. Rope handles great, also quite durable, but it twits quite a lot, especially after abseils or long day of climbing - can be frustrating.. twists go away if you suspend it from height regularly.